Serious games have one key aspect which drives their success – to impart knowledge while engaging the participant. Serious games can highlight issues, improve education or explain/solve complex problems. These games communicate often difficult subjects through a unique medium in a way that is compelling, while creating awareness. The Australasian round of the Serious Games Showcase & Challenge was launched in 2012 to highlight the talent from our region. It was the first time that the competition was run outside of the United States, as a regional qualifier for the annual I/ITSEC International Serious Games Showcase & Challenge event in Orlando, Florida. Today, it continues to introduce Australasian talent to the world stage. The SGSCA provides a fantastic opportunity for national and international exposure among the simulation and IT communities. Finalists are invited to showcase their games while attending the ASC, with the winner from each category awarded an entry, and $2,500 funding assistance, to present their game at the International Serious Games Showcase & Challenge Competition held at the I/ITSEC conference in Orlando, Florida (late November – early December each year), courtesy of Simulation Australasia. Entries close Sunday April 28th 2019. 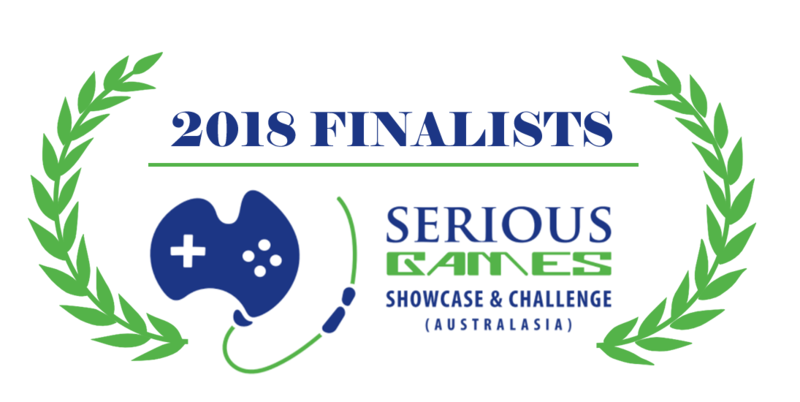 It is our great pleasure to announce the finalists for the 7th annual Serious Games Showcase & Challenge Australasia (SGSCA). This year’s finalists represent the maturing nature of the Serious Games industry in Australia, with app, game and virtual reality solutions for a diverse range of topics. The six finalists will showcase their serious games in the exhibition space at SimGHOSTs 2018 to be held at the University of the Sunshine Coast on June 28th and 29th 2018, in collaboration with Simulation Australasia and the Australian Society for Simulation in Healthcare (ASSH). SG18AUS is a combined conference that attracts an audience of program directors, clinicians, educators, academics, technology/operations specialists, and game developers. The program highlights the use of technology and virtual environments in simulation programs. Winners will receive instant entry and $2500 financial support from Simulation Australasia to attend and display their game at the global Serious Games Showcase & Challenge held as part of I/ITSEC in Orlando, Florida, November 26th-30th 2018. Designed in conjunction with Amaze, the Virtual Autism Experience (VAE) is an experiential training program that shows the potential experience of a person on the extreme end autism spectrum trying to complete a typical task(supermarket shopping) neurotypicals would take for granted. Joko’s World: Pocket Planet is a children’s game that takes the globe and creates an entertaining series of geographical puzzles. Locate countries, capital cities, flags, famous landmarks and learn about their cultural significance through games and quizzes. Lucro Island is a strategic budgeting simulation that allows management accounting students to compete against each other in real time using their accounting skills as managers of hotels on Lucro Island. Tree Hazard Assessment is a first person style game which allows firefighters to practice the skill so assessing a forest for hazard trees before, during and after a fire. Hazard trees have caused the death of firefighters in recent years, and this game allows assessment skills to be practiced in a safe and immersive 3d environment. SimuSurg, developed by Cmee4 Productions for the Royal Australasian College of Surgeons, simulates a minimally invasive surgical setting to train, and entertain, would be surgeons. Virtual Maiwar is an authentic, serious, historical, ecologically accurate and locally relevant cultural role-playing experience that immerses the user into a virtual heritage based landscape. They are challenged to learn about the lives, language, cultural practices and heritage of Australia’s First Nations people, living around what is now known as the Brisbane River. There is a ‘survival mode’ game, as well the opportunity to learn what bush food to gather, what tools and weapons to craft, where to hunt animals, and how to make shelter, all whilst adhering to the teachings and wisdom of the Elders. We would like to congratulate the winners of SGSCA 2017. Winners received instant entry and $2500 financial support to attend and display their game at the global Serious Games Showcase & Challenge held as part of I/ITSEC in Orlando, Florida, November 27th-December 1st 2017. Earthlight places the players into the role of an astronaut on board the International Space Station, giving them the chance to not only experience human spaceflight but also contribute to the journey in meaningful ways. Opaque Space is currently working in collaboration with NASA HRL and other NASA facilities – and Earthlight is a platform more than a game or a singular experience. Assets from the game, ranging from the Earth model to task-driven puzzles, are being actively integrated at NASA JSC to augment existing efforts and programs. Minda Fun With Feelings consists of three ‘mini games’; Peaceful Park, Marble Golf, and Target Your Feelings. These games are drawn from a review of current literature and market research regarding mental health/ well being and adults with an intellectual disability. An understanding of our own emotions (education) and coping strategies (regulation) are important aspects of looking after our mental health. Adults living with ID are more likely to experience mental health concerns. Congratulations to all of our finalists. The ‘Comprehensive Assessment’ game forms part of a Rural Generalist Nurse online learning program. The program aims to support and extend the clinical knowledge base and skills of registered nurses working as generalist nurses in rural or remote settings. The game was designed for new registered nurses but can be played by nurses who are more experienced. The learning in the game reinforces the necessity of taking a thorough and systematic approach to assessing and treating every patient that presents to a rural health facility. Medical Officers see the game as useful to inform doctors of the work and skill expected from rural nurses and to improve communication between the two professions. Supporting Behaviours is an application that delivers competency based behaviour identification and intervention simulation training and assessment to those involved in the healthcare sector and has utility for institutional and community based home care settings. The application focuses on: behaviour identification; root cause analysis intervention and risk mitigation encompassing a variety of behaviours (e.g. aggression, anxiety, confusion/disorientation, self-harm, and withdrawal) that relate to certain conditions in the patients. Users are presented with dynamic scenarios based on client profiles. Virtual Kamay is an authentic and historically accurate serious survival simulation that immerses the user into a virtual heritage based landscape. They are challenged to learn about the lives, language, cultural practices and heritage of Australia’s First Nations people, living around what is now known as Botany Bay. Players learn what bush food to gather, what tools and weapons to craft, where to hunt animals, and how to make shelter, all whilst adhering to the teachings and wisdom of the Elders. Valley General Hospital is a digital environment for virtual simulation training for the health industry. Players are able to learn how to operate a life support device in a low risk and highly available environment. A friendly voice will guide you through a simple scenario with true-to-life representations of hospital equipment and surroundings. With hands on experience, you will develop the skills of a trained health professional. The SGSCA provides a fantastic opportunity for national and international exposure among the simulation and IT communities. Finalists are invited to showcase their games while attending the ASC, with the winner from each category awarded an entry, and $2,500 funding assistance, to present their game at the International Serious Games Showcase & Challenge Competition held at the I/ITSEC conference in Orlando, Florida (late November – early December each year), courtesy of Simulation Australasia.